The first thing we did in Melbourne was go shopping, but not because of the great shopping in The City. It was 33°C/91°F when we left Tokyo and it cooled to 23°C/73°F in Cairns, but Melbourne was in the middle of winter. We were greeted by nighttime temperatures nearing freezing. We knew it’d be cold, but when you leave the middle of a Japanese summer, it’s hard to imagine needing to bundle up. Fortunately, the daytime weather was sunny and comfortable. 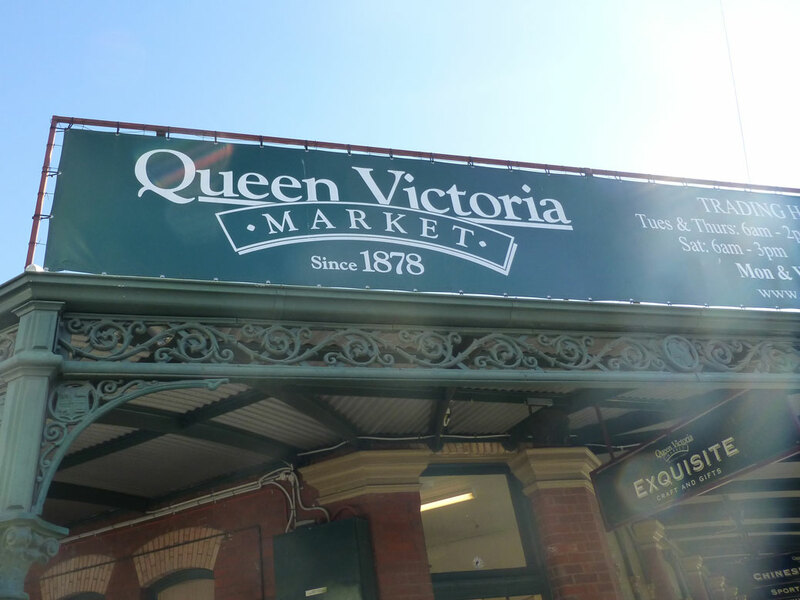 We took advantage of the sun on our first full day to explore Queen Victoria Market. The public market covers a few city blocks and features row after row of goods, food, produce and cafes. 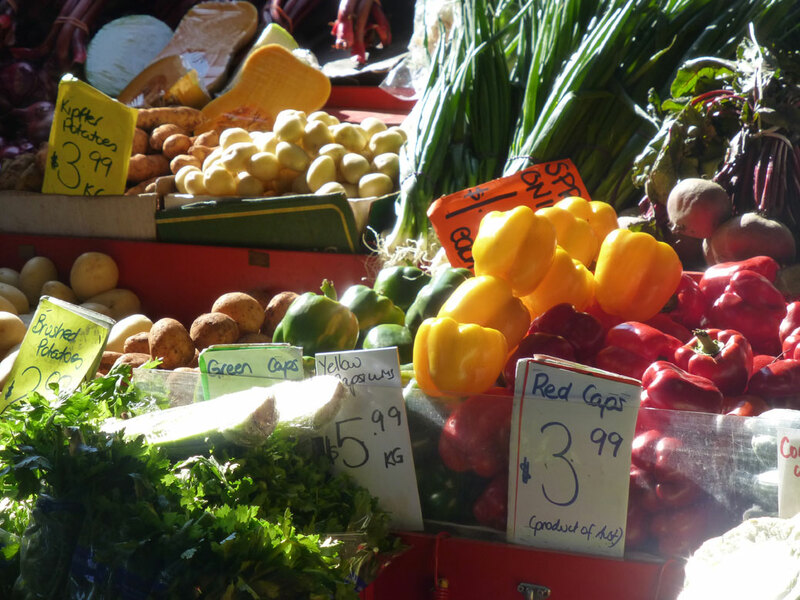 The market was like heaven with its copious varieties of fruits and vegetables, cheeses and olives and sweet desserts. We bought fresh-baked bread, local cheese, marinated olives and eggplant, fresh vegetables and a bottle of Hungarian (?!) wine which we dined on for a couple days. The longest line of the day (and if we’ve learned anything from Japan, it’s if you see a long line, get in it!) 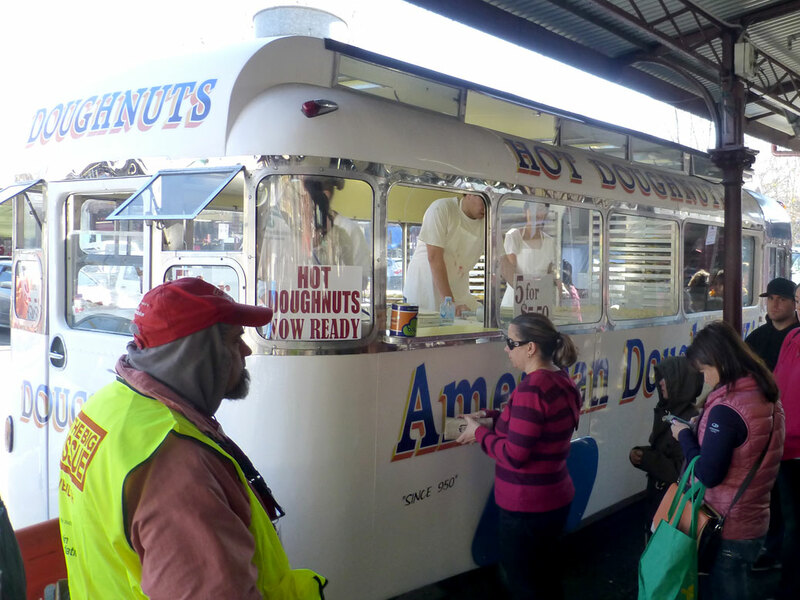 was for “American Doughnuts.” This van has been serving up hot, fresh jam doughnuts since 1950 and it was worth the wait. As for “American,” I guess it’s like an American jelly doughnut, but a little less sweet. Super tasty! The next day, we did a loop around the city center. The juxtaposition between old and new is always interesting to me. 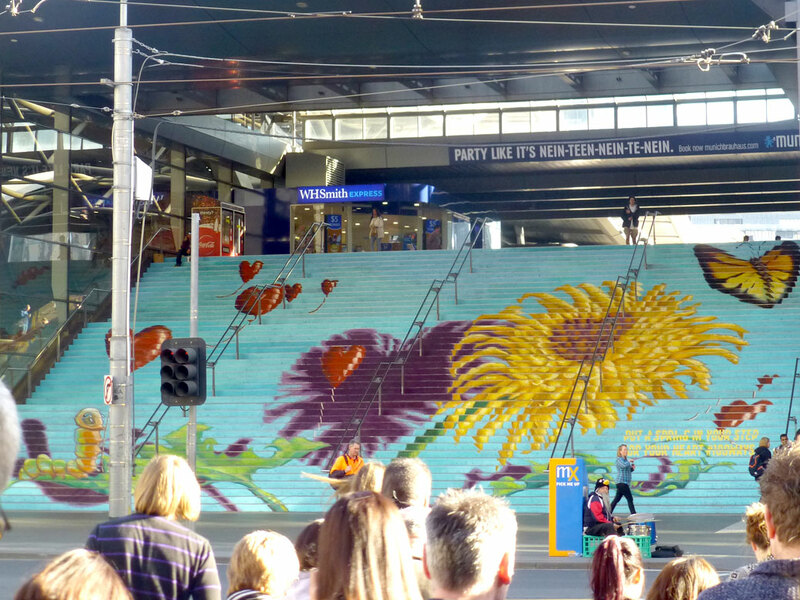 Despite its status as Australia’s second-largest city, Melbourne is still a city on the rise. Half-built skyscrapers can be found all over the city. The buildings that have been completed recently are architecturally and visually striking. One of those half-finished buildings looks like a hastily-stacked pile of books in a library basement. Others blend colors or other visual elements to create illusions that trick the eye at a distance. 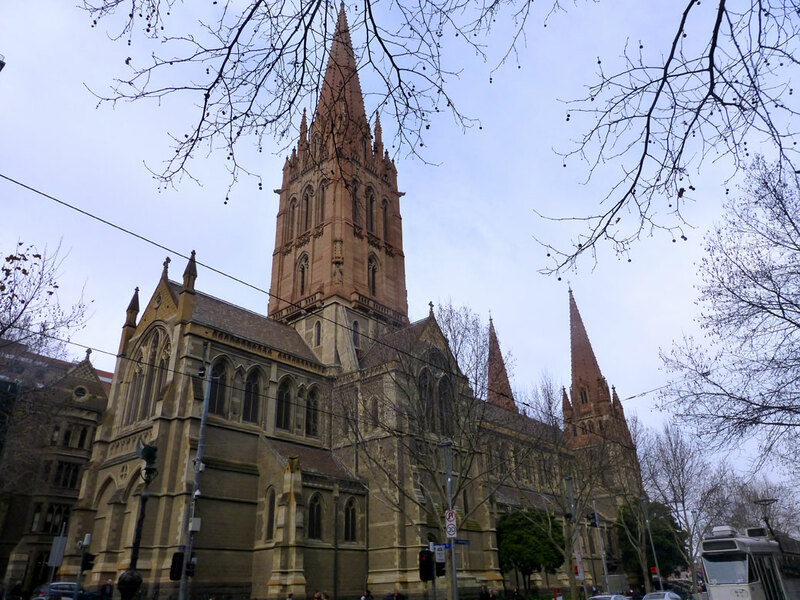 But Melbourne is a city originally established in the early 1800s, so alongside those modern marvels sit glorious architecture more than 150 years old. St. Paul’s Cathedral rises from the heart of downtown at the intersection of Swanston and Flinders streets, just a couple blocks from the ultra-modern Australian Centre for the Moving Image (ACMI) building. The simple and convenient transit system is part of the reason Melbourne gets those high livability grades. The free City Circle Tram runs around the outside of the downtown area, stopping at all of the tourist locations, including the Victoria Harbor waterfront. 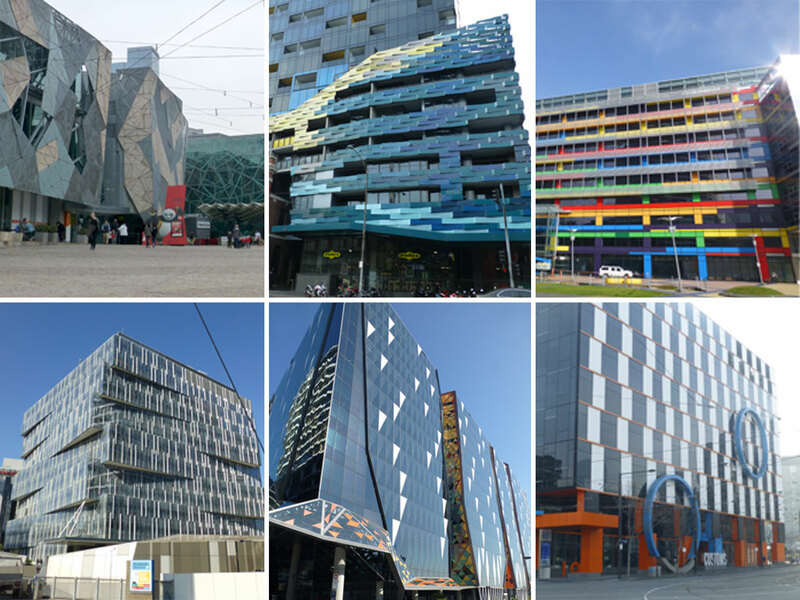 The Docklands area around Victoria Harbor is known for shopping and Etihad Stadium, home to five of Melbourne’s Australian Football League teams. While we poked around some of the shops (and stopped into Costco for kicks), the panoramic views of downtown beyond the harbor were the main attraction. Speaking of Federation Square, it’s home to ACMI, which highlights Australian film and television as well as the impact of the moving image on popular culture. It also houses the Ian Potter Centre: National Gallery of Victoria. We didn’t spring for the paid exhibitions, but the free exhibits were more than enough. A decent-sized collection of Indigenous art is available on the main floor. 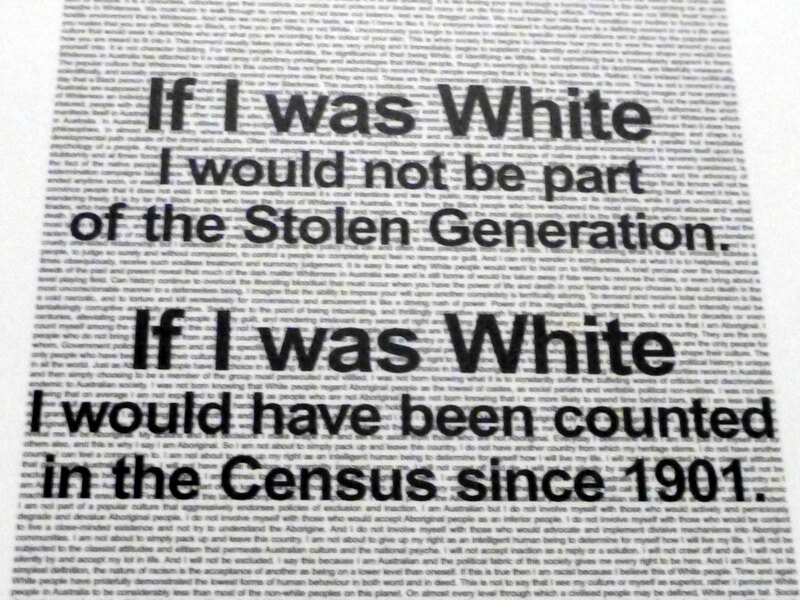 One of the more impressive exhibits was the “If I Was White” collection. 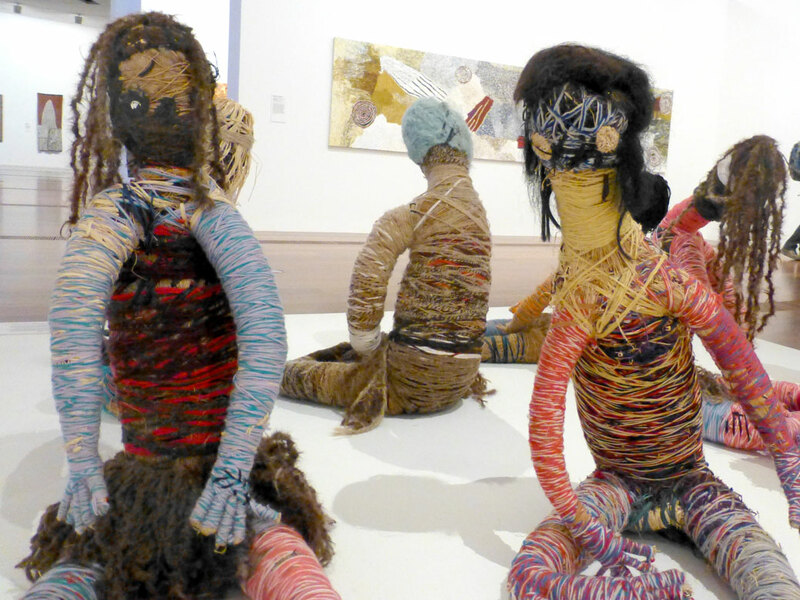 The work is meant to highlight the ongoing struggle of Australia’s indigenous (or Aboriginal) population since they were displaced by early European settlers. While their fate is not unlike the plight of Native Americans in the U.S., it’s seemed more apparent during our Australian travels and you can tell Australians might struggle with it more than Americans do. It’s certainly more than a blog post can cover. 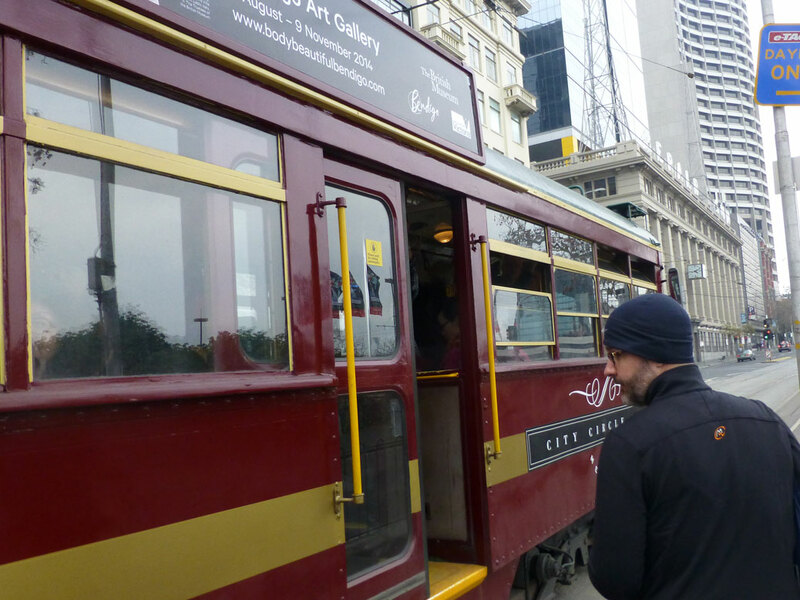 On our last day in Melbourne, we wanted to take the train to the beach in St. Kilda for the craft market, but the investment in the train card for a single day didn’t make a lot of sense. 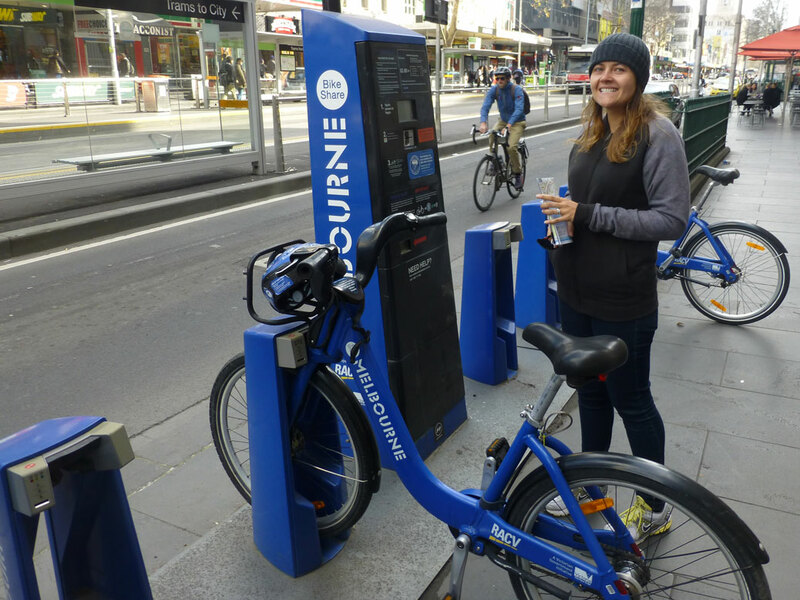 The downtown tourism kiosk suggested we rent bikes from the bike share for the day and ride to St. Kilda. The system works pretty well. You’re charged a flat fee and then an additional fee every 30 minutes, but if you dock your bike in one of the many bike parks, the time is reset. The ride was great, but we didn’t make it all the way to the beach. We started to head south out of downtown. 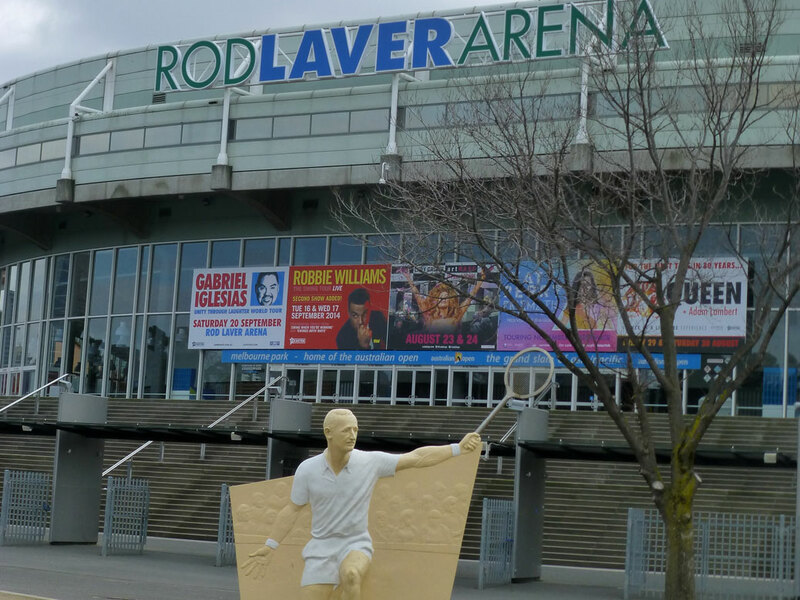 I really wanted to see Rod Laver Arena, home to the Australian Open, one of professional tennis’ four major championships. While centre court wasn’t accessible, we could see some of the practice courts, laid out in the famous blue hard court. We got a little lost, but thanks to the great Western invention of the street grid (sorry, Japan! ), we quickly found our way again. 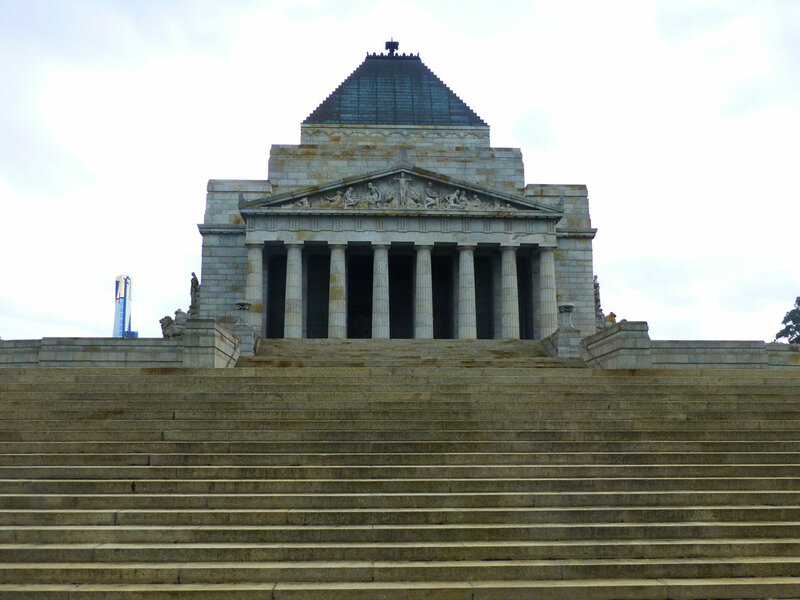 After ditching our bikes for good, we headed back toward downtown past the magnificent Shrine of Rememberance and Australia’s version of the Eternal Flame. Cupcakes from the Sunday Market. We only wanted four, but six were just two dollars more! 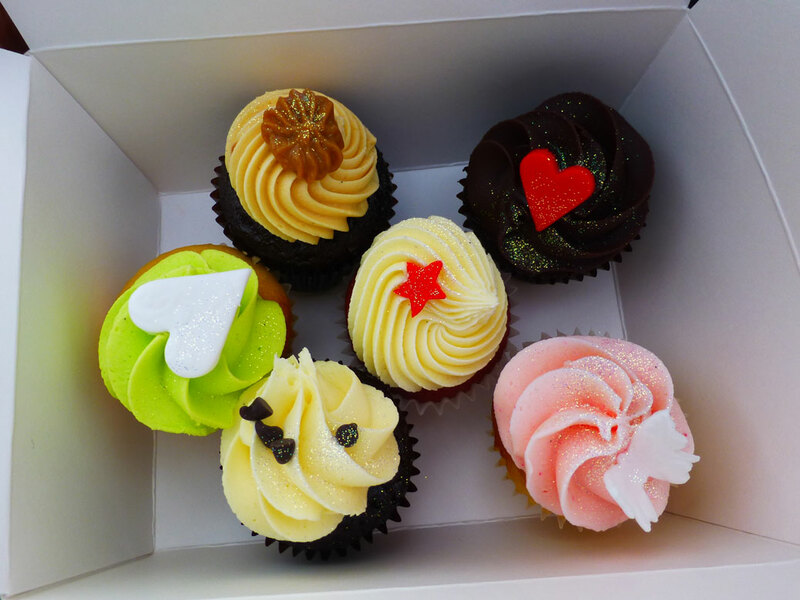 Our Melbourne adventure was coming to an end, but not before we stumbled on a Sunday Market with a booth selling artisan cupcakes. I’m not ashamed to admit that these were purchased (and possibly consumed) before a proper lunch was eaten. The miles and miles of running/bike paths, public markets, great restaurants and shopping without the overwhelming “city feeling” were reminiscent of Portland. 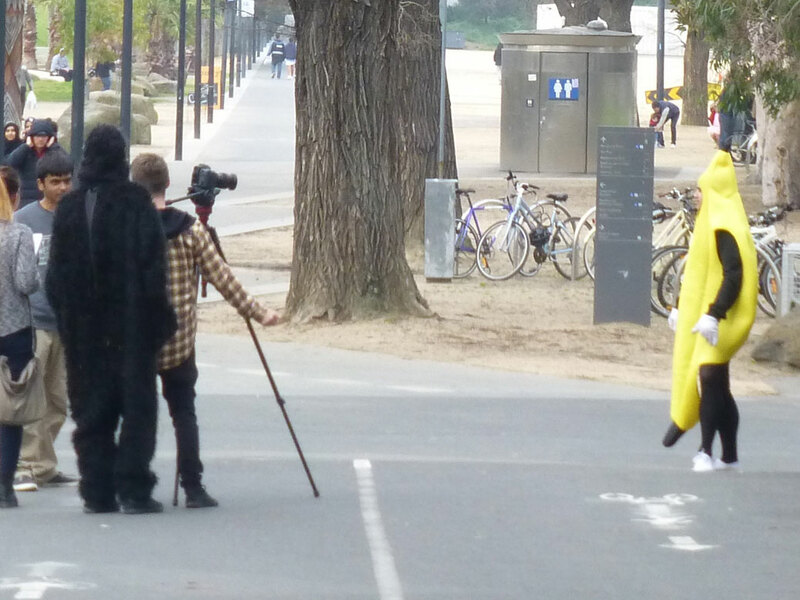 The sightseeing in Melbourne was great, but I can see how a person would really enjoy living there. I always enjoy visiting Melbourne, and it sounds like you guys had a great time! Your collage of the weird modern architecture captured one of the most curious things about the city to me — I can never decide if I love or hate those buildings, but I always find myself staring at them. Looking forward to reading about Sydney! Agreed on the architecture. I thought it was really unique to anything I’ve ever seen, especially in the quantity of odd. It seems like each new building is trying to outdo the one before it. Those cupcakes look scrumptious! How did they taste? Why, don’t they have a Costco over there? Or do the cakes not taste the same? Big news over here is the local Costco got rid of its coffee bean roaster. Cheryl is not happy! With the temps getting better, I should be getting you a couple of care packages out soon. Spices first. Dark Chocolate Peanut butter cups later. I guess the best deal in shipping is a box weighing less than 4 pounds. So smaller boxes, more often. I’ve got Sriracha sauce to send as well. Do you need peanut butter? Kirkland, regular is the better deal, but they did have the organic in as well. The cakes at Costco here look like they have a whipped cream frosting. Plus, we have to carry them on the train for an hour plus a 15 minute walk home. I’m pretty sure I’ll drop it at some point in that trip. The food court does have some amazing Hokkaido ice cream though!